Discounts of up to Rs. 50,000 on Tata Manza petrol, now starts at Rs. 4.99 lakh! Tata Motors is offering a cash discount of up to Rs. 50,000 on the petrol version of the Manza sedan. The base variant of the Manza petrol now starts at an attractive Rs. 4.99 lakh. There are no offers on the Manza diesel variants. The offer is for a limited period only. CarToq spoke to a Tata dealer to find out about the exact discounts Tata is offering for each variant of the Manza petrol. The base variant ‘Aqua’ of the Manza petrol gets a cash discount of Rs. 50,000 which brings down its price to Rs. 4.99 lakh from the earlier Rs. 5.46 lakh, ex-showroom, Delhi. Other variants such as the Aura, Aura ABS and Elan are offered with a cash discount of Rs. 30,000. However, the Aura ABS and Elan are offered with exchange bonuses of Rs. 20,000 in addition to a cash discount of Rs. 30,000. Let’s see if the new offer makes the Tata Manza, better value for money than other cars in the same range such as the Maruti Suzuki Swift Dzire and the Toyota Etios. The Manza base variant, Aqua, with an offer price of Rs. 4.99 lakh is only Rs. 5,000 dearer than the Dzire base variant priced at Rs. 4.94 lakh. The Manza Aura with an offer price of Rs. 5.49 lakh is only Rs. 2,000 cheaper than the Dzire Vxi and the Manza Elan with an offer price of Rs. 5.91 lakh is Rs. 48,000 cheaper than the Dzire Zxi. Summing up, the Manza petrol with the offer price is significantly cheaper than the Dzire in the top-end variant and comes close to other Dzire variants. The discount makes the Manza Aqua, Rs. 4,000 cheaper than the Toyota Etios J priced at Rs. 5.03 lakh. Also, the Manza middle and top-end variants, Aura and Elan are Rs. 10,000 and Rs. 66,000 cheaper than the Etios G (Rs. 5.59 lakh) and the Etios V (Rs. 6.57 lakh). Overall, the Manza is significantly cheaper than the Etios taking into account, the mid and top-end variants, though the base variants have similar pricing. Demand for petrol cars, especially in the sedan segment has seen a slump due to the rise in petrol prices. Hence, car makers are pushing the sales of petrol cars by offering cash discounts and exchange bonuses. 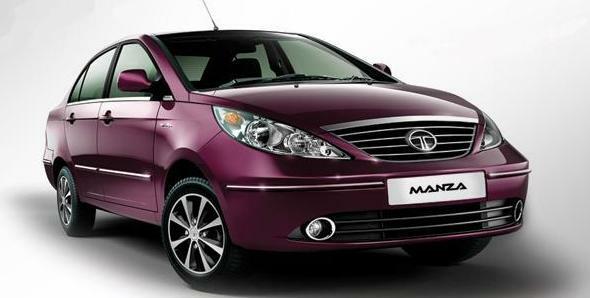 Tata Motors is following this trend and thus offers cash discount for the Manza. « Time lines for launches expected over the next 6 months!